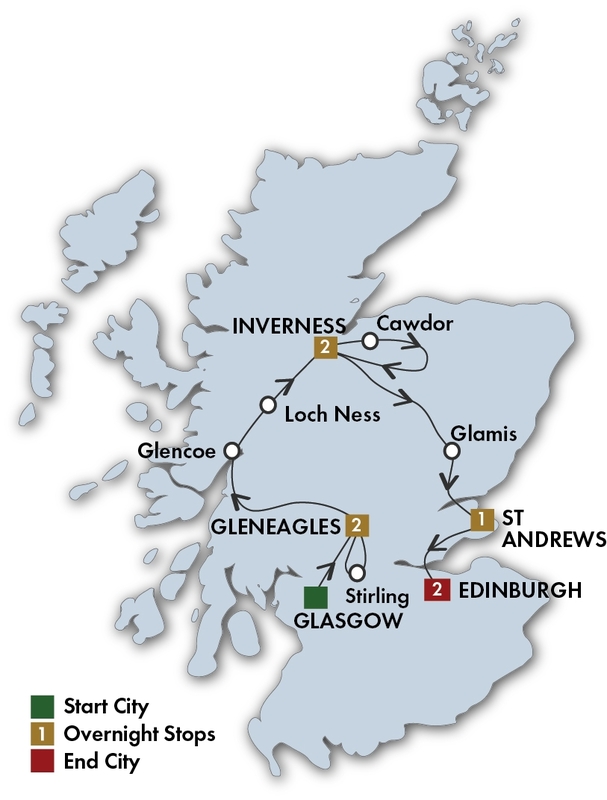 CIE Scottish Supreme Tour - CIE Tours International tours. Lowest Prices! Enjoy reserved seats for TheRoyal Edinburgh Military Tattooon August 2 – 16 departures. Experience all stages of the whisky making process and sample a wee dram. Experience the beauty of Loch Ness as you relax on a cruise of this famous body of water. 7 breakfasts (B) and 6 dinners (D) plus afternoon tea, including farewell dinner in Edinburgh. Cawdor Castle Edinburgh Castle The rock on which today’s castle stands has been a stronghold for over 3000 yearsand Edinburgh Castle has dominated its surroundings for centuries. See the 12th century St. Margaret’sChapel, the monumental great hall of James IV, opened in 1511, the Scottish Crown Jewels and the Stone of Destiny. Glamis CastleLoch Ness Cruise This large, deep, freshwater loch in the Scottish Highlands is approximately 23 miles longand forms part of the Caledonian Canal. It is the second largest Scottish loch by surfacearea at 21.8 square miles after Loch Lomond, but due to its great depth, it is the largestby volume. Loch Ness is best known for the alleged sightings of the legendary Loch NessMonster, also known as “Nessie”. St Andrews Castle & Cathedral Stirling Castle Urquhart Castle sits beside Loch Ness in the Highlands of Scotland. The castle is on the A82 road, 21 kilometres south-west of Inverness and 2 kilometres east of the village of Drumnadrochit.